If you’re planning a family movie night then you must try these popcorn recipes and seasonings! Popcorn is by far one of our families all time favorite snacks. We love to try new popcorn recipes and seasonings. The more unique the popcorn recipe, the better! There really is a popcorn recipe for every taste bud – everything from sweet cookie and candy inspired recipes to something with a little more kick, like taco popcorn! Everyone loves to much on a big bowl of popcorn, especially while watching a movie! Family movie night is a great way to spend time with the family. With four kids, we have a pretty good sized family – at least by modern standards. With a big family it means going out to the theater just really isn’t in the family budget all that often. I mean, taking our family of six to the theaters can easily cost $100 dollars, or MORE! Planning a family movie night is a great alternative to going out to the movies. You can snuggle in on the couch with warm blankets and make up a batch of popcorn with your favorite seasonings to munch on. The kids will quickly look forward to the tradition of having a family movie night – especially if they get to pick out a new popcorn recipe to try! When it comes to popcorn recipes and seasonings, I am more of savory type. My kids, however love anything that is sweet – more of a popcorn treat than a popcorn seasoning! The good news is, there is a popcorn recipe that will satisfy everyone and what fun to try all of the different popcorn recipes out there. Choosing a popcorn recipe could be simple, pull a name out of a hat, or you could let kids each take a turn picking their favorite popcorn recipe to try. Another fun idea for choosing a popcorn recipe is to plan it based on the theme of the movie! And if it’s just mom and dad having a movie night, there’s even a few adult flavored popcorn recipes. I’ve chosen some of our family favorites and scoured the internet for the most fun and unique popcorn recipes and seasonings that I could find to share with you all. 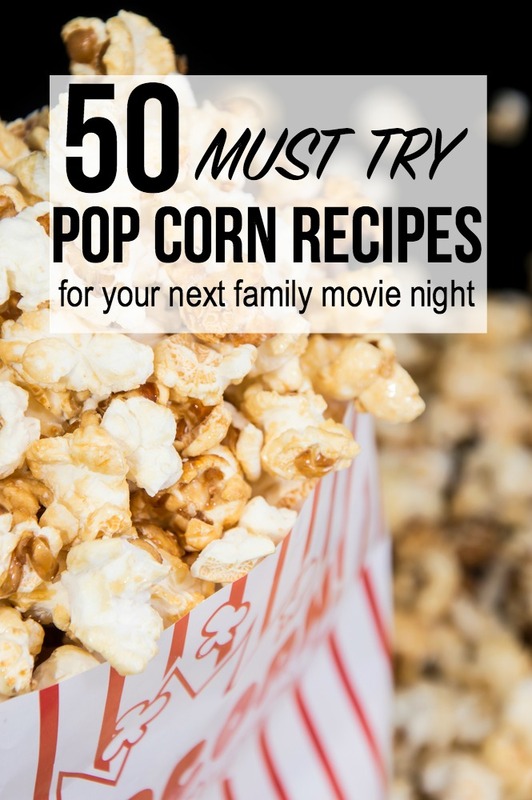 These are definitely must try popcorn recipes for you next family movie night! S’mores Popcorn Recipe: S’MORES SATURDAYS IS BACK !!! Do you have a favorite popcorn recipe? I’d love to try it!